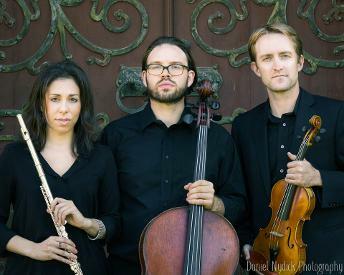 Trillogie Trio offers live music for concerts, corporate events, wedding ceremonies, cocktail hours, banquets, fundraisers and more featuring the flute, violin and cello. 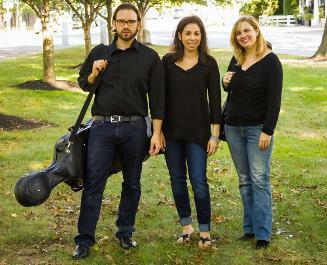 Trillogie Trio is a dynamic team of professional musicians offering music in all styles for concerts, weddings, cocktail hours, banquets, fundraisers, corporate events and more. Acclaimed for the passion and ease of their performance, Trillogie is sure to dazzle you and your guests! Trillogie Trio prides itself in spreading the joy and beauty of music. We genuinely love what we do and hope that this shines through our every performance. We make it our goal to perform for our every audience with charisma and finesse! Trillogie also makes flexibility, approachability and positive group dynamics a priority. We will both arrive and leave your event with a smile, always ready to answer your questions and follow your directions, even when last minute changes are necessary. We want our clients to know that we are there to help make their event even better than they dreamed it could be! Have special music that you'd like performed for your event? Though we already have an extensive repertoire of music in many styles, we are always eager to expand it by preparing special requests for our clients! The soundtrack for your event is one of the most important features in your planning, so we will work with you side by side to make it one of a kind! Contact us for rates and availability. We look forward to playing for you! Jaclyn and her crew are an incredibly talented group of people. They were very flexible with the selections I chose, and even when I told them just to add a little music here and there during the ceremony, they knew exactly what to do. I absolutely LOVED having live musicians for our ceremony. It was a really nice addition to the moment. Jaclyn is amazing to work with. I am one of those people that is addicted to checking my email, and gets a little antsy if I don't hear back from someone after 24 hours. Jaclyn would respond to me so quickly that I felt like I was the only crazy bride she was dealing with (and I know that wasn't the case). I could not have asked for a better experience working with this group. They truly are amazing. "I can't express how wonderful Jaclyn and the musicians were from: contacting her through email, discussing the music that was appropriate for the ceremony and cocktail hour and of course their performance on the day of my daughter's wedding. Professional from beginning to end! We were specific regarding the contemporary pieces that we wanted and the Trio even learned a new piece "Falling Slowly" from Once, that they played as my daughter walked down the aisle. Jaclyn also made some recommendations for pieces that were exactly what my daughter wanted. Truly a pleasure to work with such talented musicians that added a special touch to our wedding!" Copyright 2017 © Trillogie Trio, All rights reserved.